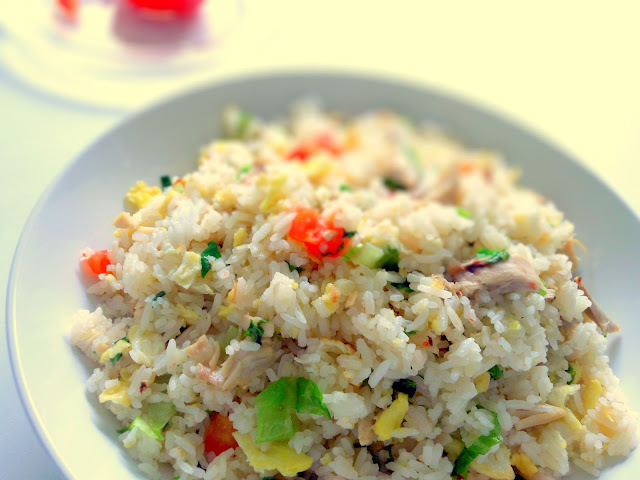 Making fried rice is simple and easy. So why this recipe if everybody can make fried rice? My reason is to give you an idea for using leftovers. Yesterday when I opened my fridge, I saw that we had leftover rotisserie chicken and cooked rice in there along with some lettuce that will go bad soon if I still don't use it. In order to finish all of these ingredients, I thought of making fried rice. The basic ingredients for fried rice are rice and eggs. Other than that, you can pretty much add anything to the rice. Well, I do have some advice. Do not use rice that is mushy. It works easier if the rice doesn't stick together. Also, you should use high heat to stir fry the rice. That will give it a smoky flavour. Add some salt to eggs and mix. Heat oil in a deep frying pan or wok over high heat. Pour eggs into the oil and stir until half solid. Add cooked rice and keep stirring. Add the remaining ingredients and toss a few times.